A new Mitre study says the U.S. Navy needs a fleet size of 414 combat ships that would include 160 destroyers and cruisers, 72 attack submarines and 14 aircraft carriers, Breaking Defense reported Friday. Sydney J. Freedberg Jr. writes Mitre’s 15-year shipbuilding plan for the Navy would cancel the Littoral Combat Ship program and replace it with new classes of ships such as frigates and magazine ships. Mitre’s study suggests a “high-low mix” of a small number of high-end combat vessels and a large number of low-end warships such as magazine ships – MG(X) – and diesel-powered attack submarines. The nonprofit organization recommended that the service branch continue to build nuclear-powered Virginia-class submarines at a rate of two vessels per year and replace the San Antonio-class amphibious transport dock vessels with either three modified Watson-class cargo ships or six Spearhead-class expeditionary fast transport ships. 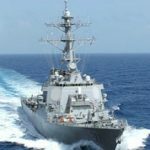 Mitre also called for the Navy to prioritize the deployment of the Hyper-Velocity Projectile for use with electromagnetic railguns aboard destroyers and cruisers, the report added.